Bird’s Nest Necklace and Soap Giveaway. I am so excited to be hosting our second giveaway in honor of reaching 200 likes on our farm’s Facebook page (you can see our page here)! Yay! This giveaway will have two winners. The first winner will receive a bird’s nest necklace and matching earrings, handmade by me. The second winner will receive one bar of our cold process soap (winner’s choice). 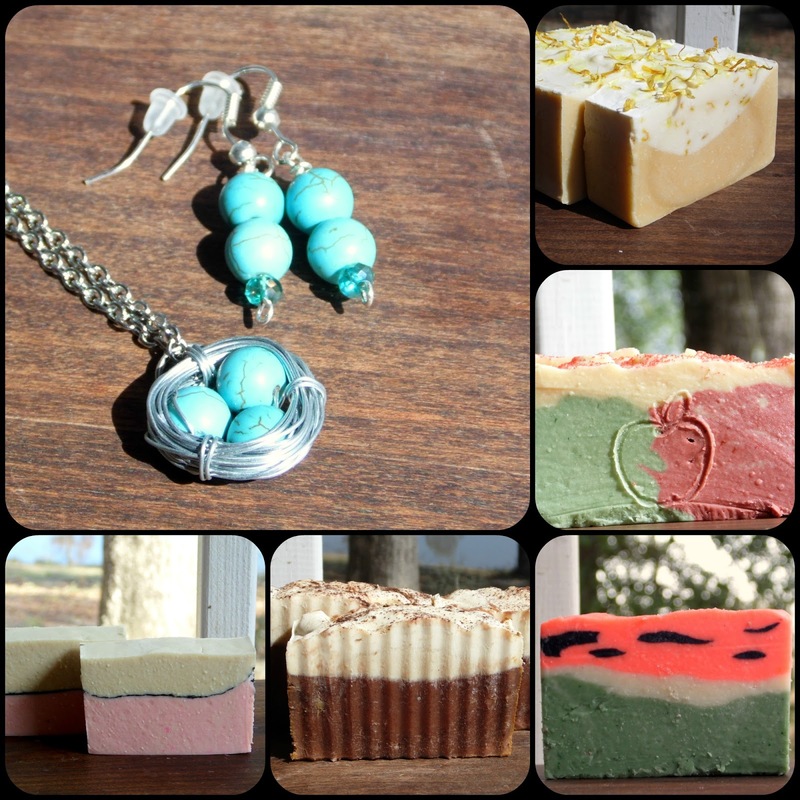 You can visit the soap page on our website here or our Etsy shop here. Now for the legal part: Open to entries worldwide. Two winners will be chosen at random when the contest ends on March 23, 2013. The winners will be contacted by email to obtain their mailing addresses – if after 48 hours I haven’t received a response, a new winner will be chosen. As soon as possible, I will mail out the prizes. When you sign in to Rafflecopter make sure to include an email address so that I can contact you. Previous post: Sunday Stealing – The Meme from Memphis. If I won, I would love to try Apple Jack Peel! Thanks for the giveaway. I love your blog! Japanese Cherry Blossom – thanks! One of my favorites! Best of luck. I would also choose Japanese cherry blossom!! Great choice – it smells so good. Good luck. Excellent choice. Best of luck! Ooh, that’s a nice one. Best of luck!! You know, I must have miswrote that one when I updated our site. It’s actually called sunshine 🙂 Don’t know where my mind was that day lol. But it’s a lovely soap – one of my favorites 🙂 Best of luck!! Oh, it smells lovely and very green 🙂 Best of luck!!! Definitely Aloha Paradise. I could use an island getaway. Haha, I could too 🙂 Good luck!! It smells yummy, too 🙂 Good luck!! I’d like to try the Japanese cherry blossom. Great choice! Best of luck!! I would choose Oh Baby! One of my favorites! Best of luck!! One of my favorites! Good luck!! I think I’d go for the Japanese Cherry Blossom. Excellent choice! One of my faves because it’s yuzu scented 🙂 Good luck! Ooh, Bama Belle – one of my favorites 😉 Best of luck! I would get the Sunshine soap–perfect for waking me up in the morning! Great choice! Best of luck! I think I would try the Bama Belle soap. Sounds amazing! Wonderful choice!!! Best of luck!!! The Aloha Paradise because I love the smell of pineapples! Good choice!! Best of luck! definitely bacon and eggs and watermelon crawl… and also bay rum! Lol, all excellent choices 🙂 Best of luck!!! Bama Belle sounds terrific and nicely scented. Oh, it does smell great 🙂 Good luck!!! I’d love to try the Aloha Paradise soap. Excellent choice! Best of luck!! I would have to choose the Monkey Farts soap. Couldn’t resist. Haha, one of my favorites, and not just because of its name lol. Best of luck!! I would choose aloha paradise. Great choice!! Best of luck!! Great choice!! Best of luck!!! Excellent choice!! Best of luck!!! I’d choose monkey farts or Bama Belle. Both excellent choices!!! Good luck!! Two of my favorites!!! Best of luck! I would try the Sunshine one. I think sunshine looks like a good chose, but all of them sound good.Do you make goat milk soap that has lavender an vanilla mixed love that smell? I would choose the Highland Fling Soap!